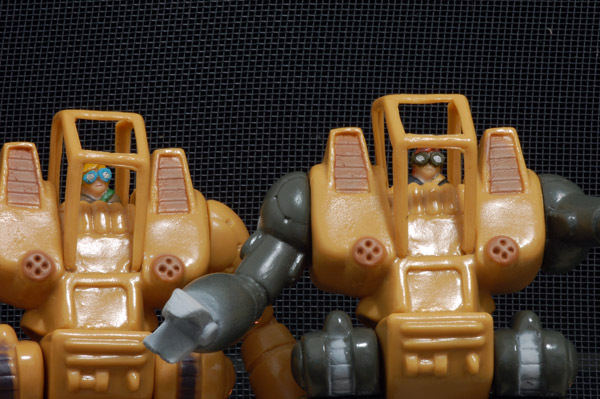 When not making fun, weird kaiju, Sunguts took the time a few years back to make a vinyls of a pair of the secondary Walk Machine mecha from Xabungle. The ‘work’ mecha in Xabungle were all pretty goofy, so they make for great sofubi. Even the roll-cage frames are vinyl, after having had the inside parts cut out. Something I never realized until I got mine were that they also come with little DIY flesh vinyl pilot busts that you need to trim, and paint if desired. Obviously I painted them. The pilot busts are about a quarter of an inch tall, so I threw a little color on them to make them stand out.